I love pizza. It was a major weakness pre-HMR because I could polish off a whole pizza without thinking. And while I miss pizza and am spending time during my HMR journey thinking about how I can approach this food in the future, I have been working to attempt the flavors while staying in the box. I think I have done a pretty good job capturing the flavor profile (or I have been in the box too long!). I posted a picture above with the condiments I used but you can probably find different brands that are HMR friendly. This entire dish revolves around the chicken pasta parm entree which already has the Italian theme going on. 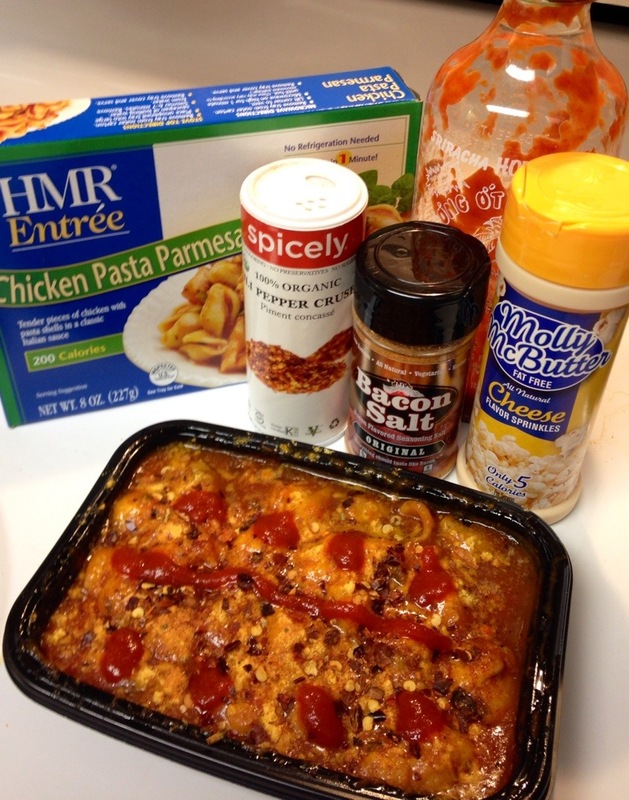 It has a tomato sauce with a cheesey taste, a carby component, and chicken. You can amp up the sauce with fresh or dried herbs if you want. I add the cheese powder to amp up the cheese flavor. I add the bacon salt because it adds a mild smokey taste that reminds me of a pepperoni or bacon garnish. I also love heat and pile on the chili flakes on a real pizza so I add this and then add some drops of Sriracha which has a sweet and spicy taste that I think rounds out the pizza. If you hate spice then you can turn those down or leave them out but in addition to heat I also think these two additions help amp the tomato flavor. I prepare the dish by microwaving the entree and then sprinkling the condiments on top. Then I get the layered flavor with each spoonful of the entree. Did you enjoy pizza pre-HMR or some other favorite dish? Have you attempted to find that flavor profile and how did you do it? When I find something I love doing, I want to share it with everyone so they can also enjoy it. As the 5k bug bit me, I knew I needed to share. I convinced my mom in the early Spring months that if I found a 5k in her area that she could walk, we could do it together. So I went in search of something fun! I must be a good researcher because I found what has so far been one of my favorite races ever, and perfect for a first-time 5k participant like my mom. 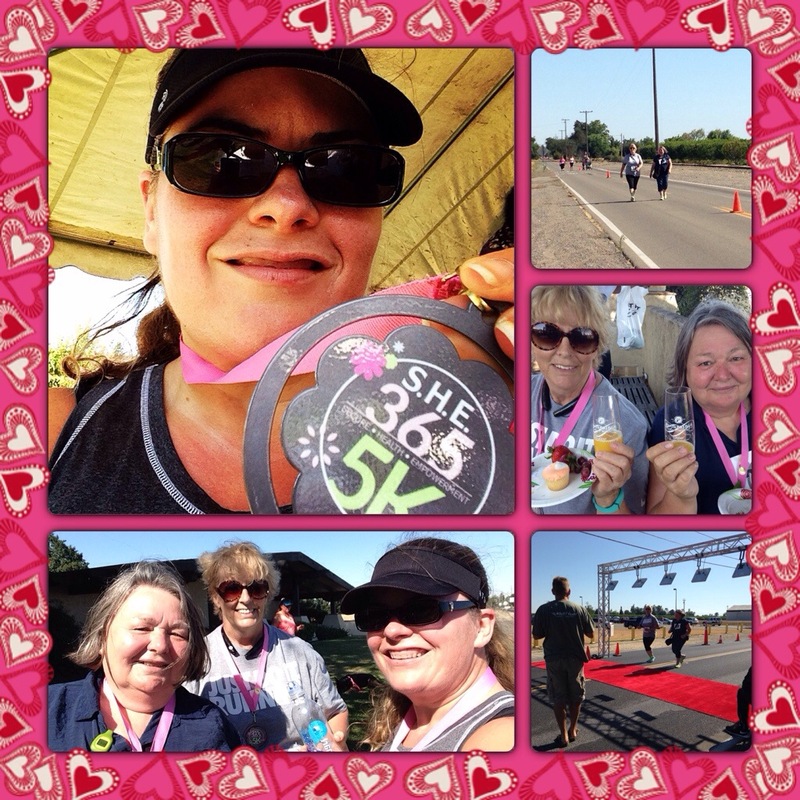 The SHE 365 5k was held in Lodi, California on July 12, 2014 and it was in it’s second year of being held. The female-focused race was a tad pricier than some I have seen (we paid $45 several months in advance) however it is a drop in the bucket compared to many of the giant 5ks I have seen (Diva’s and Disney – looking at you!). And you TOTALLY get your money’s worth at the SHE 365! Let’s start with the swag – you get a female-cut tech shirt, an awesome headband and shoelaces with the race logo, a medal, a mimosa in a take-home stemless champagne glass, two full-size Lindt gourmet chocolate bars, not to mention fresh fruit and mini cupcakes at the finish party (and additional discounted wine-based cocktails to celebrate!). I drove down to Lodi from San Jose on the morning of the race where I picked up my mom and her friend Jene. Neither of them had participated in a 5k before but both had been training hard to walk the distance with a goal of finishing in under an hour. We arrived at the winery at the start of on-site packet pick-up (they had options to pick up earlier but since I lived out of town I really appreciated the day-of option!) to find plenty of parking, signage, and friendly volunteers. We collected out bibs (the rest of the swag was available after finishing), and began our pre-race preparations. At first, we saw only two portapotties – which I worried would be an issue but eventually bathrooms in the winery and tasting rooms were opened and we barely had a wait! The crowd arrived over the next hour and I learned there were only about 200 hundred participants, many of whom were also participating in their first 5k. This was apparent at the start when many of the walkers started front and center. A small hiccup (considering the race only used gun time and not chip time) however with such a small group, it was not that big of a deal. The course was flat and relatively straight, with one turn, a straight shot down a country road, a u-turn and then one turn back to the finish. A perfect course for a possible PR and I was stoked! When the buzzer went off, I took off with the front of the pack, feeling fabulous! Less than 3/4 of a mile in, I got a terrible side cramp. I knew these could happen but I had never experienced one like this before. I slowed to a walk and tried to stretch out, even stopping to massage it a bit. It lessened slightly so I picked up my pace a bit, but still kept it pretty slow (I am slowly seeing a need to purchase a GPS watch so I can actually know my pace in real-time). I reached the hydration station at the halfway point and walked through it, slowly sipping the water. And the side cramp went away! Upon evaluating the situation later, I realize I had gone to bed much earlier and woken up much earlier than normal and didn’t hydrate near enough during the 90-minute drive so I was probably under-hydrated as opposed to other races. I passed my mom slightly after my reaching two mile marker and the two of them passing mile one. My mom shot some fun video footage of the race including me running by. There were no official photographers at the race, so that video and the selfies I took are our official proof of the fun we had! This was the first race where I actually heard my name called! That was really neat and it was fun to finish on the red carpet. I continued to hydrate after the race and went to the car to grab some HMR muffins before heading back to cheer on my mom and Jene. When they got near the three mile mark, I took some photos and joined them for a short while. They were having a blast and decided to jog out the last bit to the finish. I scored some great action shots and they finished up at just over 58 minutes – beating their goal by over a minute!!! The official times were being broadcast on giant screens and so I went to check out how I finished up. I knew I still managed to pull a sub-30 but didn’t know if it was a new PR. Turns out it was by just a few seconds! And I placed 25th overall at the race which was a huge deal to me. In fact had I been in the 20-29 age group instead of the 30-39, I would have placed second in age group (I think I was 11th in mine – so many fast women in the 30-39 age group!). So despite the cramp, I feel like I have been making progress. Overall, this was a fabulous experience for all three of us. I think both Jene and my mom were inspired by their PR and the possibility of shaving off time in future 5ks and I learned an important lesson about hydration. If I could PR after a cramp like that, I can only imagine what I could do if I properly prepared! This race WILL be on my calendar next year. Super supportive volunteers, great course layout, killer swag, and amazing weather. I couldn’t ask for a better 5k! Travel continues to guide my experimentation in the kitchen. 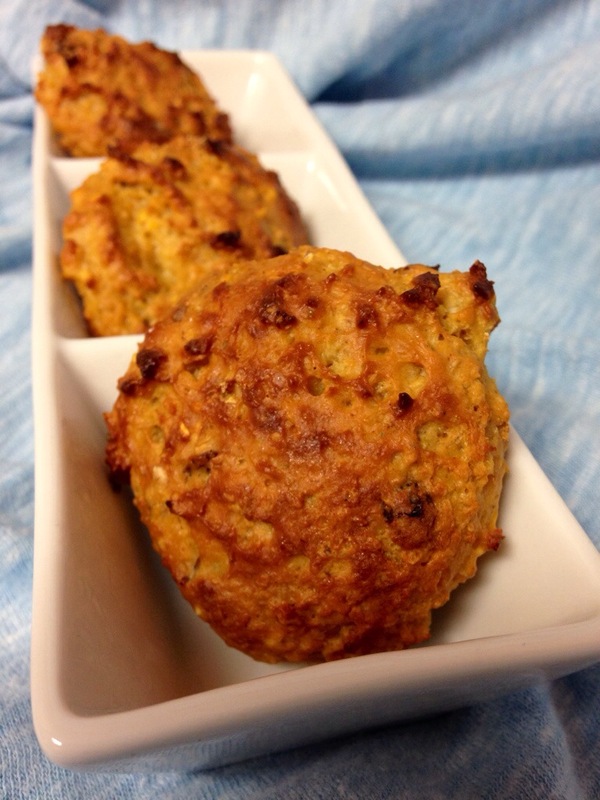 I wanted a savory option that could be easily carried on planes, trains, and automobiles! The 70 shakes have an egg protein in them that helps with the muffins but wouldn’t work well for a savory biscuit. I use the chicken soup but it took awhile to keep the end product from being very dense. The secret is stirring in the baking powder just enough so it’s mixed and activates but not to over stir and lose the bubbles that make it fluffy! I also use a 2-tbsp scoop to portion out the dough on the silpat which means less handling and fewer bubbles lost! Mix oatmeal and 1 cup of water. Microwave for two minutes. Stir and let stand for several minutes. Add in soup, cheese powder and the remaining ¼ cup of water. Stir until combined. Once dough is mixed, add baking soda. Carefully fold in without losing the air bubbles. Gently scoop onto a baking pan covered with a silpat mat or parchment paper. Bake for 15 to 25 minutes until the biscuit is cooked through. Cooking times will vary significantly based on how big you make each biscuit and your personal oven calibration. This recipe makes six ½ shake servings of three baby biscuits for my prescription. Don’t forget this is a low-density preparation of the soup and oatmeal. Make sure to drink lots of fluids while enjoying these! I have enjoyed reading so many race reviews/recaps that I thought it might be cool to start documenting some of my own races. It’s a great way for me to remember my experiences from some of my favorite races! 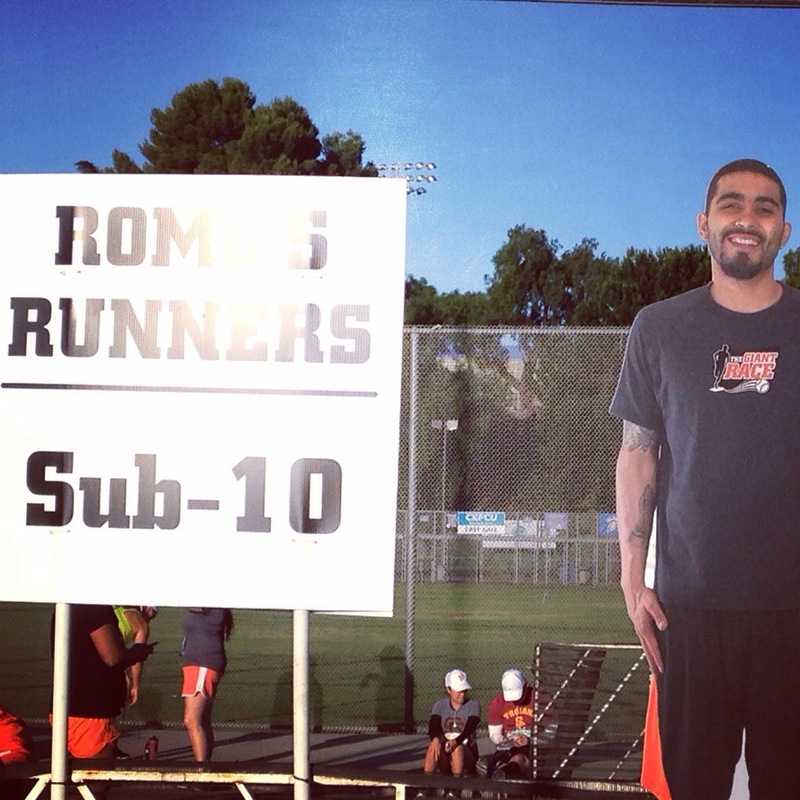 The San Jose Giants 5k on June 28, 2014 was part of “The Giant Race” series which starts with a race at Spring Training in Arizona in March and will end with a 5k/10k/half marathon in San Francisco in September. 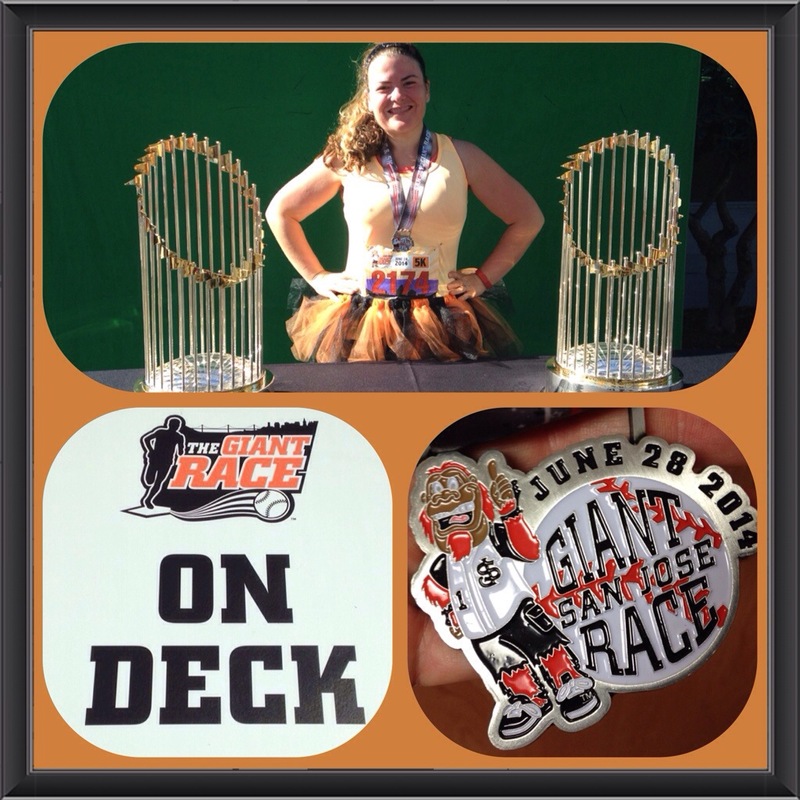 I completed the San Francisco Giants Plat to Plate 5k in 2009 and had a blast running with fellow baseball fans so I knew I needed to do this race again. Then I learned if I ran in San Jose as well, I could earn special ear buds and another race was registered for! Awww I wanted to be in Buster’s group! Gotta get faster! I woke up with anticipation and rushed to get ready on race morning. While I had completed several races prior, this was my first officially timed 5k since starting my HMR weight loss journey and I was both excited and scared about how I would fare. Parking was super easy (probably because I got there over an hour before the start!) and so I used the time to warm up and make multiple trips to the porta potties (I was nervous!). Then I checked out the starting line which was set up with three self-monitored pacing areas. I knew I didn’t belong in the Sub-8 area although I do love Mr. Posey! Someone might have wanted to be clearer in oral instructions though because many walking Posey fans who were new to 5ks joined this area near the start which did lead to some clogging of the course at the beginning! I put myself in the Romo Runners group because I knew my easy training runs were between 10 and 11 minutes for the most part and that I planned on picking up the pace. However I stayed to the side just in case I had seeded myself wrong. 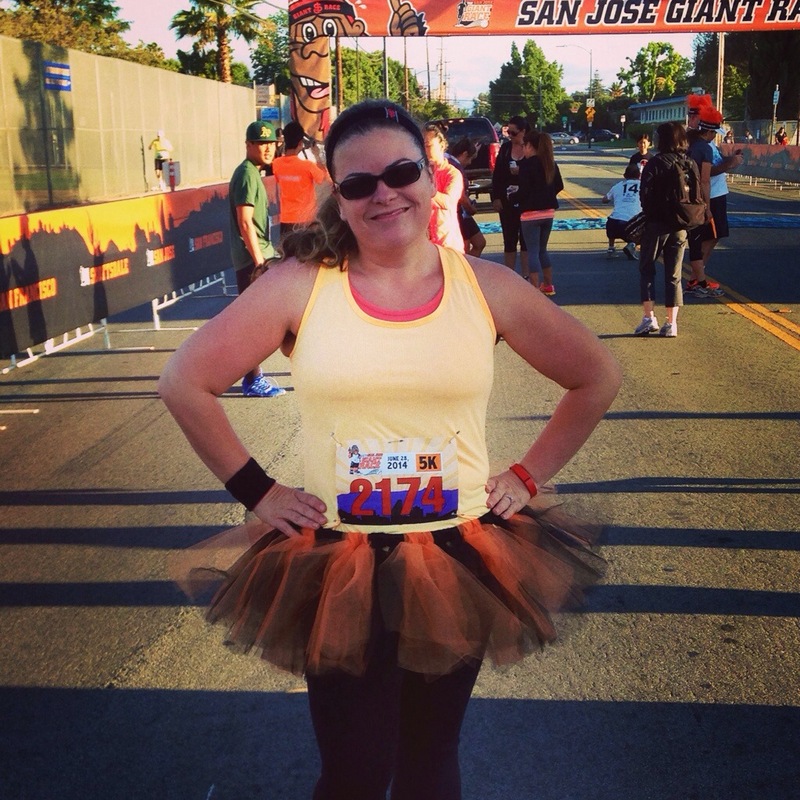 Part of my pre-planned race attire was a tutu from Glam Runners. I was inspired by the causes they raise money for and although I felt silly putting it on, it also felt kind of cool. Not to mention the orange and black just scream Giants Pride! I got lots of compliments along the course and also motivated another runner as I heard the comment right behind me “gotta beat the tutu” (they didn’t but hey if it keeps you moving!). The course itself was great – we went around the neighborhood near the ballpark as well as through part of Happy Hollow park. The 5-miler got to explore more of the park – maybe I will try that one next year? I had never been in Happy Hollow and it was a bit difficult with some cobblestone and grass running in addition to the paved path but the coverage of the trees was a welcome break from the sun! I was aiming to finish in under 35 minutes which allowed me to fade. I was secretly hoping to break 32 minutes which my trainer told me I could manage but I didn’t want to get my hopes up. After the first mile pace time was announced in my ear (using the MapMyFitness app), I thought I had gone out too fast! The voice said my first mile was completed in 8:54! So I forced myself to slow down – worried I would burn out before I finished. I slowed to what I thought was my normal training pace but at mile two the voice said I had completed a 9:34 mile. I did some quick math and realized if I picked it back up, I could potentially break the magical 30 minute barrier that I thought was impossible. The race ended on the baseball field which was incredibly cool. As I finished a 9:20 third mile, I realized I would be cutting it close. It was difficult to re-motivate my legs which had enjoyed slowing down but I pushed hard during that last tenth of a mile. As I rounded the outside of the park, I pumped my legs, racing through the parking lot and onto the field. Forgetting about the difference between chip and gun time, all I saw was the clock counting down at the finish and knowing I had less than 20 seconds to make it over that finish line to get an under 30 finish. That last stretch was an 8:52 pace and I did it! The gun time was 29:52 but the actual chip time was 29:23 which was than I ever imagined I could complete a race. Some people may dismiss my 9:18/9:28 average pace (per GPS/per race results – pace changed based .07 mile difference extra distance dodging walkers) however I am still, weeks later, fully acknowledging how far I have come. And knowing I slowed down in mile two gives me extra motivation in upcoming 5ks to see how much more speed I can bring! I am definitely doing this race again next year. Even if I can’t pose with the WORLD SERIES CHAMPIONSHIP TROPHIES again, it was a fabulous local race capped off with an evening of baseball and family time. Can’t ask for a better day! All decked out in Orange & Black at the starting line! After spending months of eating cold HMR Five Bean Casserole at debate tournaments, I was determined to find a new way to enjoy it. I have been playing with this recipe for almost two months trying to find a balance of flavors and while these pack a flavorful punch, I am sure there are still ways to play with it even more. This is the entree of the month at my clinic and I am traveling a fair amount in July, so I will continue to tweak it and will add modification suggestions if any turn out. I have also frozen two batches for upcoming trips, so I will also post how it travels. I have made these to enjoy at parties and on road trips. They are great warm and cold! Preheat oven to 350 degrees. Prepare baking sheet with a silpat/silicone baking mat lightly sprayed with cooking spray. I use a small baking ring to form my cakes and I also lightly spray the inside of the ring with cooking spray. Mix all ingredients *except* the casserole in a microwave-safe bowl and microwave for 90 seconds. Add in casserole and mix well. Spoon mixture into ring molds or make small mounds on your cooking sheet. If using ring mold, press down lightly to pack the mixture together before gently lifting the ring mold. 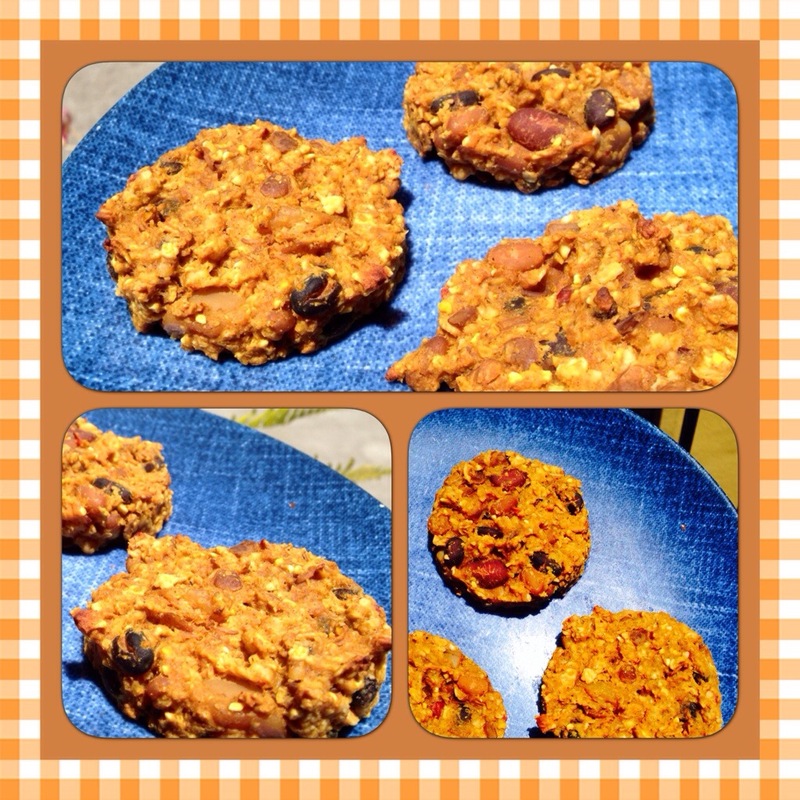 Bake for 25-35 minutes depending on your oven. You want the cake to be relatively firm. You do not need to flip over the cakes, however it is optional after 25 or 30 minutes depending on the thickness of the cake if you want it browned on both sides. The cakes pictured were not flipped over during the baking process. This recipe made about 8 cakes. On my prescription it is a shake and an entree. 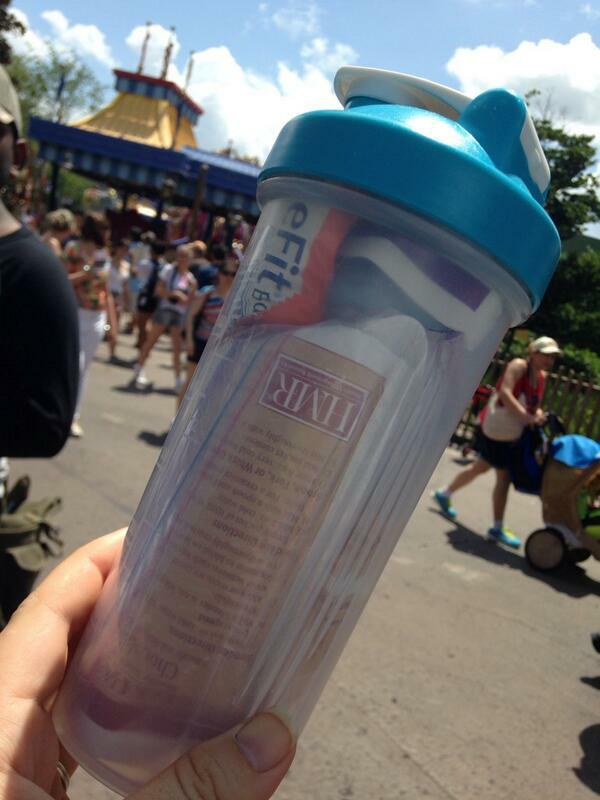 Please remember this is a low-volume preparation for the shake, so drink lots of fluid to help with the volume/fullness!